Sunrisers Hyderabad rose to the top of the points table, with their third consecutive win, beating Delhi Capitals by 5 wickets. It was Delhi’s third loss in 5 matches and the second loss in 3 home matches. For SRH, Bairstow and Warner gave another successful opening partnership with 64 runs in less than 7 overs, registering their fourth 50 plus runs partnership in four matches. Failure of most of Delhi Batsmen allowed Capitals to register merely 129 runs, 9 more than the lowest score on this ground. Mohammad Nabi and B Kumar with two wickets each played crucial roles in the victory. Delhi bowlers performed well to confine SRH batsmen post powerplay overs, taking the game till the 19th over while defending the humble total. With 246 runs, Bairstow is now just 18 runs short of Orange cap holder and his opening partner David Warner. To the contrary of the coach Rocky Ponting’s expectations, Feroz Shah Kotla’s pitch turned out to be slow and low. It was the kind of pitch best suited to the visitors. In the third over, they were made to realize that something was wrong with the pitch, as Shaw got out trying to slog the ball that kept slightly low. At the end of the powerplay, Dhawan top-edged to Nabi, at the total score of 36. With such a pitch and two wickets down in the powerplay, the road was not at all smooth for the hosts. Delhi failed to build a partnership with a poor show from the middle order batsmen. The captain, Shreya Iyer, played a very good inning and stayed till the 17th over but no one gave him required support. With wicket falling every 15-20 runs, the final score was at least 30 runs short than the par score on this ground. This was even after Akshar Patel’s cameo with his two sixes in the last over. Ponting too expected 160-165 despite a slow and low pitch. The bowlers did a fabulous job by controlling SRH batsmen once Bairstow got out in the 7th over. By removing Warner in the very next over, and blocking runs for next few overs the bowlers, especially Patel and Rahul Tewatia took the game close till the end. A few more runs to defend and the result could have been in their favour. For the Capitals, the captain Shreyas Iyer remained highest scored with his 43 off 41. Tewatia was the pick of the bowler with 1 for 10 runs in 3 overs that included 12 dot balls. It was Patel’s day as he excelled with both the bat and the ball, scoring 23 off 13 and took a wicket, giving away just 18 runs in his four overs. For Sunrisers, it was a very good toss to win and bowling first. On such a pitch to chase was a wise decision as the batsmen always know how fast or slow they need to play. Also, with the brand of bowling attack SRH possess, it was an ideal pitch for them to bowl first, which they did, and scythed through the host batting line up. After giving away 8 runs in his first bowler, B Kumar came back with the bang, bowling out Shaw in his second over. Nabi got two crucial wickets of Shikhar Dhawan and Rishabh Pant, restricting Delhi to 56 for 3 at the end of 10th over. Rashid Khan bowled out frustrated Iyer in the 17th over while Kumar took the wicket of Morris in the penultimate over. Had Kaul confined Akshar Patel in the last over, the final score might have been much less. Bairstow got a lifeline in the second over when Patel dropped his catch. He hit a six and a boundary in the 3rd over and 3 boundaries in the 4th over. Bairstow’s catch drop proved to be disastrous as barring him, no other batsmen crossed 20. After Bairstow left at the end of 7th over, SRH already scored 64. With only 66 to get in remaining 13 overs, the SRH were never in a hurry to catch the required run rate. One small partnership of 27 between M Pandey and V Shankar was sufficient to reach home comfortably. Bairstow once again played a pivotal role scoring 48 in 28 balls that included 9 fours and 1 six. Nabi played a key role with the bat and the ball – taking two wickets for 21 runs, and making 17 runs while batting. B Kumar took two wickets for 27 runs. S Kaul bagged two wickets for 35 runs. Delhi Capitals are to play an away match against despondent RCB on 7th April at Chinnaswamy Stadium. After two consecutive losses, Delhi Capitals would be determined to win against RCB and maintain or better their position in the points table. 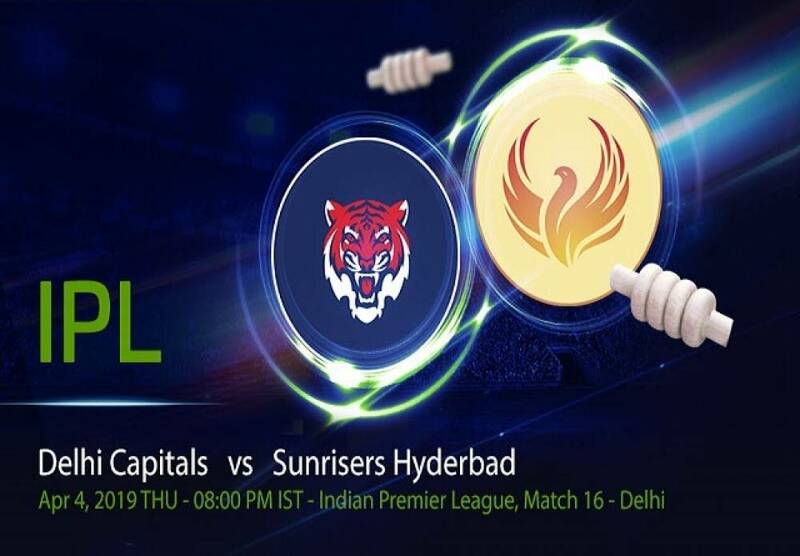 Sunrisers Hyderabad’s will next play a home match against Mumbai Indians, on April 6th, at Rajiv Gandhi Stadium. It will be a great contest between Mumbai’s bowlers Bumrah, Malinga and SRH batsmen like Bairstow, Warner. SRH look rock solid and will look to keep the winning streak going and remain at the top. Our goal is to give our readers updated and interesting information on cricket events and Free Cricket Betting Tips! We will have new cricket betting predictions each day! We recommend Betrally India for online cricket betting! Claim 100% up to 7500 INR bonus at Betrally India!